Regular as clockwork the British government puts up prescription charges in England every year on 1st April. The yearly increase in the sickness tax falls on April Fools Day and we must be fools to continue to put up with it. 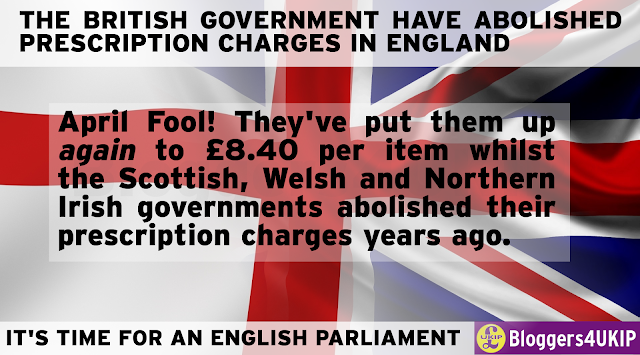 The Scottish, Welsh and Northern Irish governments have all abolished prescription charges over the past few years but the British government has no desire to do the same in England. Prescription charges are just one of many examples of the British government ignoring English public opinion and a symptom of the democratic deficit arising from the refusal to devolve power to an English Parliament. It's time the British government did the honourable thing and put it right.